FIRST KNOWN PRODUCER OF VINO COTTO (COOKED WINE SYRUP) IN THE U.S. The larger the grapes, the better! If you can find big, round, seedless globe grapes, those work perfectly. Heat the oven to 400F. 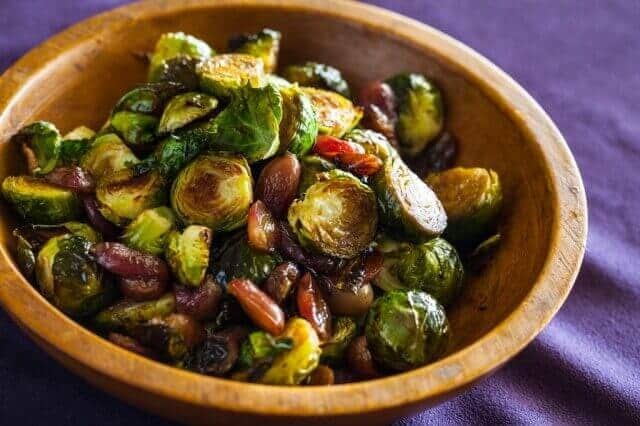 On a baking sheet, toss the Brussels sprouts and grapes in just 2 tablespoons of the olive oil to coat evenly. Roast in the oven for 20 minutes, tossing them halfway so they cook evenly. Pierce a Brussels sprout to make sure they are cooked through. Remove baking sheet from oven. In a small bowl, whisk the remaining olive oil, soy sauce and balsamic vinegar. Toss this sauce over the roasted Brussels sprouts and grapes that are still on the baking sheet. Return to oven, place on top shelf. Turn oven to broil and cook for 3 minutes or until the sauce is bubbling and caramelizing. Watch them carefully so they don't burn! Remove from the oven and serve immediately. *Make your own delicious balsamic vinegar by mixing vino cotto with wine vinegar.